Trying to decide whether or not to take your teen tribe to Ripley’s Believe it or Not? We understand - it’s a challenge to find attractions that will pacify our moody offspring. We took a leap of faith and, believe it or not(pun intended), we all had a blast at Ripley’s Believe It or Not in Orlando, FL. 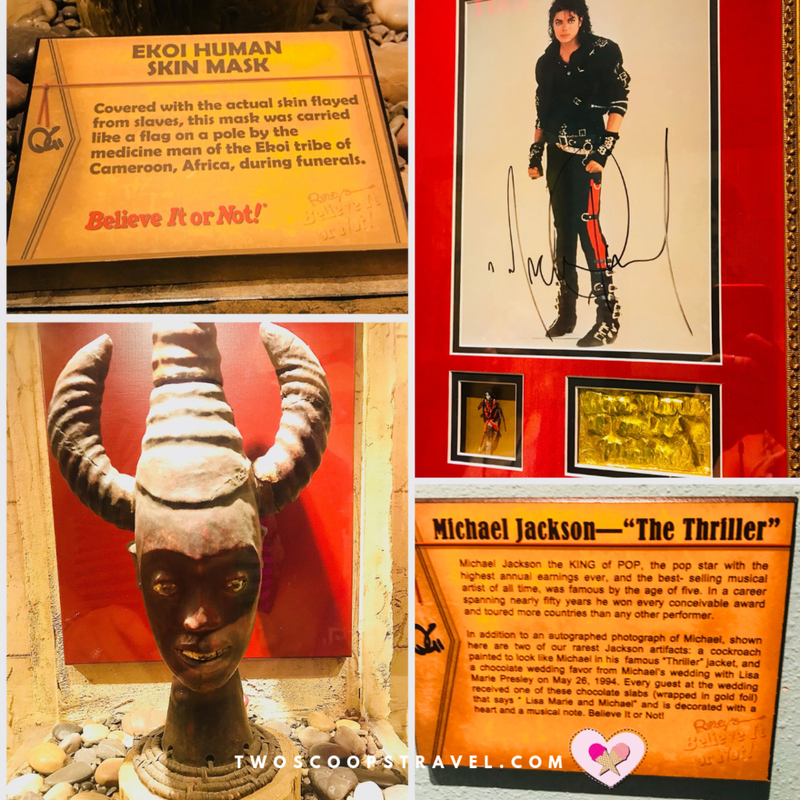 When planning the visit, we knew at least one teen in our group would be entertained by the long list of useless factoids that live in places like Ripley’s and the Guinness World Record Book. Anyway, before you go, you should know it takes a minimum of an hour to go through the entire museum. Depending on your group, your visit may take a little longer. Ripley’s has numerous interactive displays and lots to read. As such, it’s a great half-day stop on an Orlando sightseeing itinerary. First stop - the bathroom. Even if you don’t have to ‘go’, you should totally ‘go’. And by all means, press the button!! The bathroom alone is tons of fun. But there is still a whole museum to see! Talented at tongue twisting? You absolutely MUST try it out in order to receive the surprise at the end, so don’t skip it. Floating pool balls, a cockroach painted like Michael Jackson, shrunken heads, skin masks, two-headed calf, tallest man who ever lived, Ripley's has it all! I challenge you to walk through the tunnel without getting dizzy! We visited Ripley’s with our Two Scoops Tweens, Sydney and Holli, and big brother Jayce who was 14 at the time of the visit. The verdict? Every single one of them LOVED Ripley’s. In fact, the consensus was they all liked Ripley’s better than Sea World! Really? Either we have really boring kids, or Ripley’s is more fun for teens than we anticipated. PARKING: FREE for cars and coaches. There are 3 parking areas conveniently marked. Buses and Motor Coaches are encouraged to use the bus parking area in the north side parking area, where it is marked "Buses". HOURS: Open 365 days a year, open from 9:00 am until midnight, Last entry at 11:00 pm. DURATION: Takes about 1 hour to 1.5 hours to enjoy the entire museum. Adults - $19.99 at door / $16.99 online. Children (3-11) $13.99 at door / $11.99 online. Click here for tickets. Sign up on the website as there are constant specials. It is also cheaper to purchase on Ripley’s website than at the entrance. Online tickets can be presented on your phone, printed copies not necessary. Tickets are non-refundable. ACCESSIBILITY: Entire museum is wheelchair accessible. If you have a couple of extra hours in Orlando, Florida, we highly recommend a stop at Ripley’s Believe it or Not. Have you been to one of the Ripley’s Museums? What was your favorite weirdness? Ready to plan your family vacation to Orlando? Call us or send us an email. We’d love to help plan your Best Vacation Ever and our travel services are absolutely FREE for you!